WHEN YOUR BUSINESS NEEDS MORE GREEN, MAKE YOUR DIRECT MAIL ADVERTISING BLUE. The Valpak blue envelope is the proven cooperative direct mail advertising vehicle for businesses that are serious about growing! Since 1968, Valpak has helped hundreds of thousands of businesses just like yours attract new customers and keep their existing customers coming back for more. In fact, last year alone, Valpak delivered over 20 billion offers in nearly 490 million envelopes. So why do businesses continue to turn to Valpak time and time again? Our readers recognize and respond to value. They rely on Valpak to inform them of local options for their daily and long-term buying needs. 9 in 10 households receiving Valpak are aware of it, open it, and browse through the offers inside. In fact, your message is much more likely to be read in Valpak than with other direct mail companies. While other direct mail companies saturate a ZIP code or market, The Blue Envelope allows you to mail to just your ideal consumers. The resulting smarter, highly targeted mailing stretches your marketing dollars further than ever before. The Valpak envelope reaches a highly desired audience; primarily educated women ages 25-54 with incomes typically one-third higher than average. They’re a key part of households, a third of which include children, with high levels of spending on many goods and services. Valpak lets you choose the perfect advertising format for your product, message, business goals, and overall budget. Select from 4-color coupons, flyers, magnets and much more. Design your ad yourself or let our experts help you create your most effective offer. Mail just once or select to schedule multiple runs to maximize your visibility and success. The majority of Valpak ads contain a promotional offer and expiration date making it easy to track new and repeat business. Your account executive will help you evaluate your return on investment for your marketing program at any time. To learn more about getting started with Valpak, Contact Us today and ask how you can get your business growing today! When you’re looking to maximize your advertising results, look to the Valpak blue envelope. No matter what business you’re in — dining and entertainment, home improvement, health and beauty, automotive, and much more — Valpak provides you with a full range of professional marketing services and more than 40 years of expertise to ensure that your message reaches your ideal customer. What is the Valpak Blue Envelope? 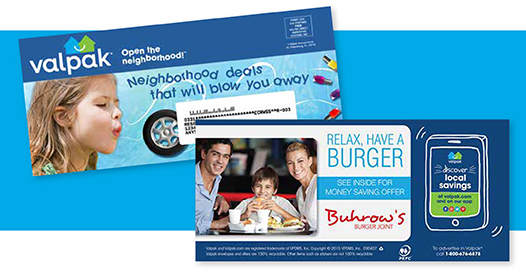 The Blue Envelope is a cooperative direct mail medium that contains a mix of ads from national, regional, and local advertisers. Depending on your marketing strategy and budget, you can choose from a variety of formats, including coupons, flyers, postcards, and more with a variety of color and targeting options. Valpak is delivered to approximately 110 U.S. Nielsen markets (DMAs), in 45 states and four Canadian Provinces. Nearly 20 billion ads are delivered annually inside the Valpak Blue Envelope. Each year, more than 51,000 businesses choose Valpak for their advertising needs. Nearly 490 million envelopes are mailed annually to more than 40 million unique addresses in the U.S. and Canada. Why is the Valpak Blue Envelope Right for You? Valpak results are trackable and measurable, unlike most mass media. Watch your ad dollar work for you as your offers are redeemed and sales transactions grow. Keep your message in-front of consumers and your brand on their mind. Valpak mails 12 times per year, helping you keep your message top of mind with consumers. Reach each household for a fraction of the cost of a stamp. Since Valpak is a cooperative mailing, you’re sharing delivery costs with many other businesses. Thus, the postage and production costs are shared, letting you maximize your marketing dollars. The Blue Envelope has a format to fit your needs. Want to know more about the options you have when advertising in Valpak? Download our Detailed Specifications. It will tell you all about our different formats, and the options you have with each. With Valpak’s precise audience targets, you’ll be able to maximize your marketing results. Valpak cooperative mail uses a unique proprietary segmentation system called Neighborhood Trade Areas (NTA®). The selection criteria for an NTA is part of the reason why the Blue Envelope offers a high level of performance and measurability. Zero in on your best customers. Send your message to a single NTA, city, DMA, or any combination that matches your desired consumer profile or coverage area. Who is your best customer? What do they look like? Valpak allows you to send your message to those consumers with the demographics you’re looking for — age, gender, homeownership, purchasing behaviors, income, families with children, etc. Valpak mails each region of the U.S. and Canada once per month so your message arrives within a targeted time frame in the city, DMA, state/province or region of your choosing. Lots of Options – One Blue Envelope. So what does an ad in the Blue Envelope look like? Our variety of formats allow for total customization, no two ads in Valpak look the same. Below you can download samples of ads that have run in Valpak, just to give you an idea of the possibilities.